Halloween is a bit of a nightmare when you and your family follow a pretty restrictive diet like being vegan and gluten-free... add in there avoiding GMOs, food colorings/dyes, and high sugar foods and you're left with not so much to eat. Usually this is no problem for me because I'm not a huge candy eater, and for the past few Hallowens Avery hasn't noticed too much that she doesn't eat traditional candy. But this year is different, she's 3 1/2 and she totally gets the whole idea of Halloween, trick-or-treating, and how there is a lot of candy involved. 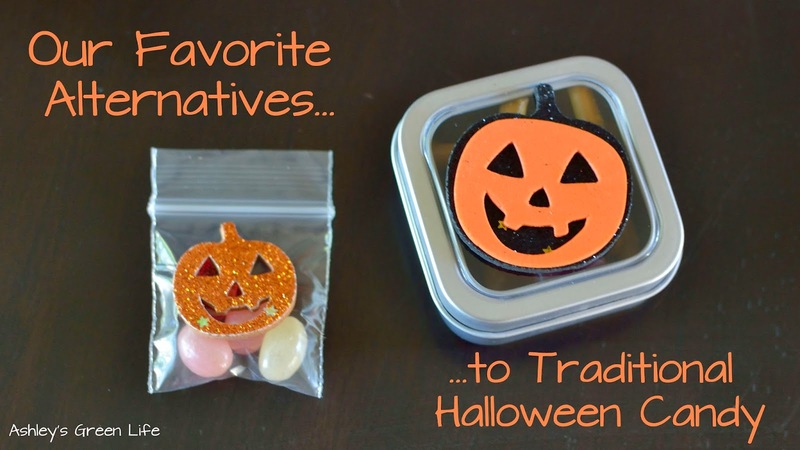 This leaves me kind of stuck...I don't want to isolate her and tell her "no" that she can't participate in traditional Halloween activities, but at the same time I also don't want her eating traditional candy that contains ingredients I would never even allow into my house. What's a green mama to do?! Just like any other green/healthy swap I've done in the past, I knew it would be all about finding a comparable replacement. 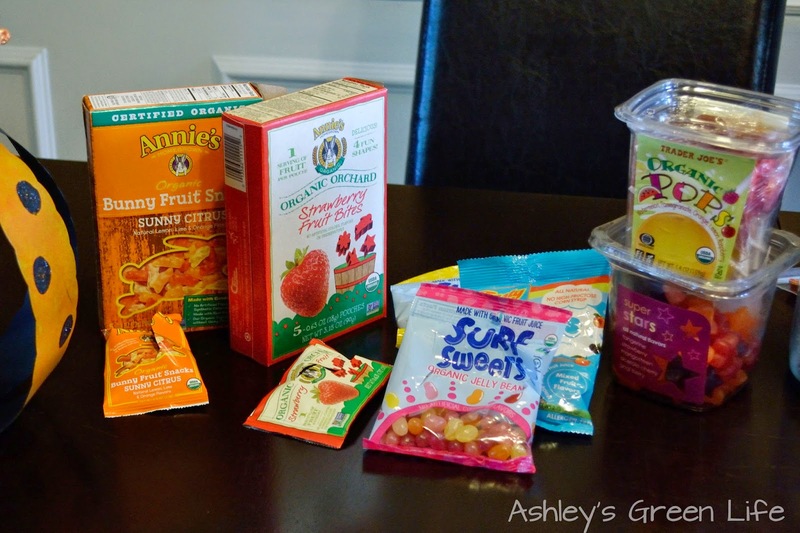 Follow along as I share what healthier alternatives I've found and how I will be using them this year. As you can imagine, in our home there's not a lot of candy. 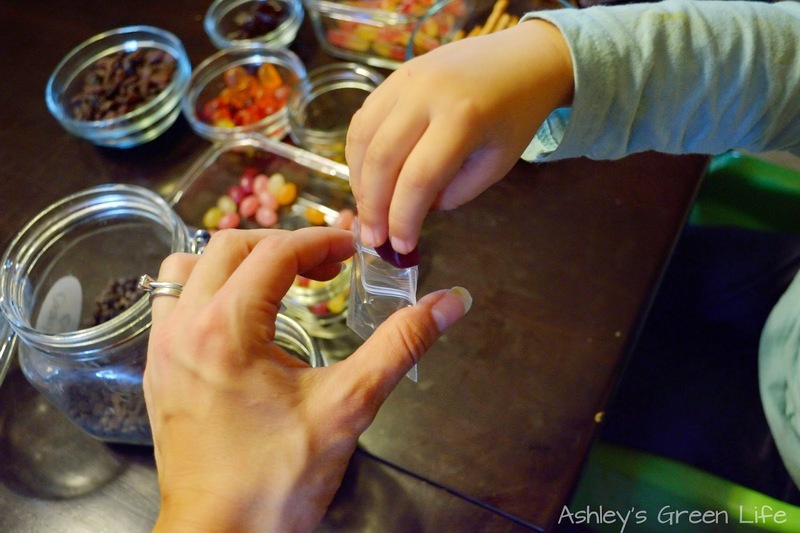 Occasionally she gets it for dessert, and it's because that's how I potty trained her a year and a half ago, but even then it's only 2-3 pieces (small gummies/jelly beans). But over time we have found some cool favorites that we keep stocked up on. Most of these are organic, contain no-GMOs, and no artificial food colorings. They are not perfect though. Some still contain sugar, such as in the form of evaporated cane juice, but that's a given if you're calling it candy, right. To me it's all about keeping the portion small, and then I don't worry so much about it. 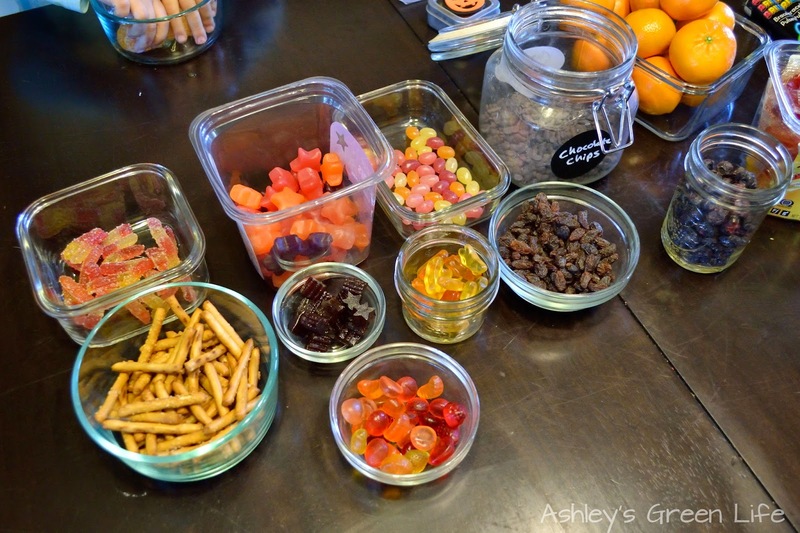 When it came time for Halloween, I knew I would have to step up my candy game to keep things intersting for her, so we went out and found a few other "new" candy alternative treats which I will share with you below. So let me breakdown my Halloween "Green Game Plan." When she goes to trick-or-treat, she will do so as usual. She'll collect the candy that's being handed out and then bring it all home. From there I will take her bag (kindly-lol), and give her a special trick-or-treat bag I've prepared for her that contains our alternative candy/toy items. 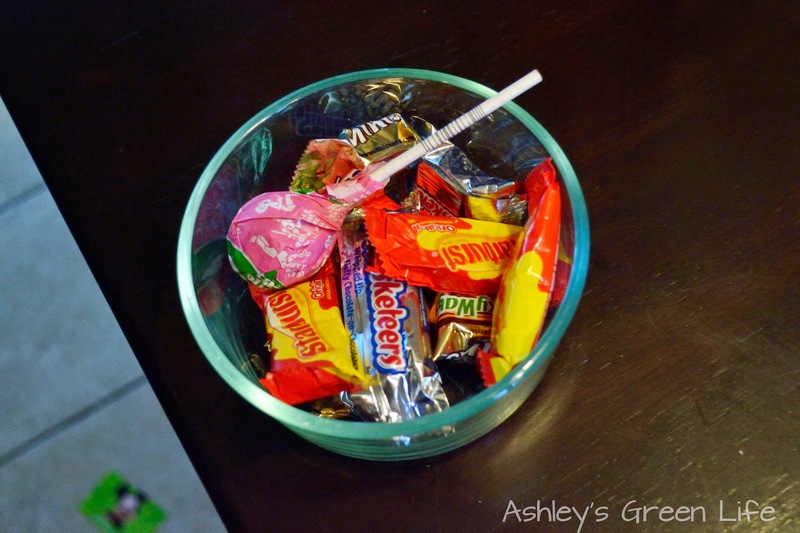 Another option I will be checking out this year is to donate our extra candy to something called, "Operation Gratitude" where you can ship out or drop off your extra candy to dentist offices and they will donate it to troops overseas. 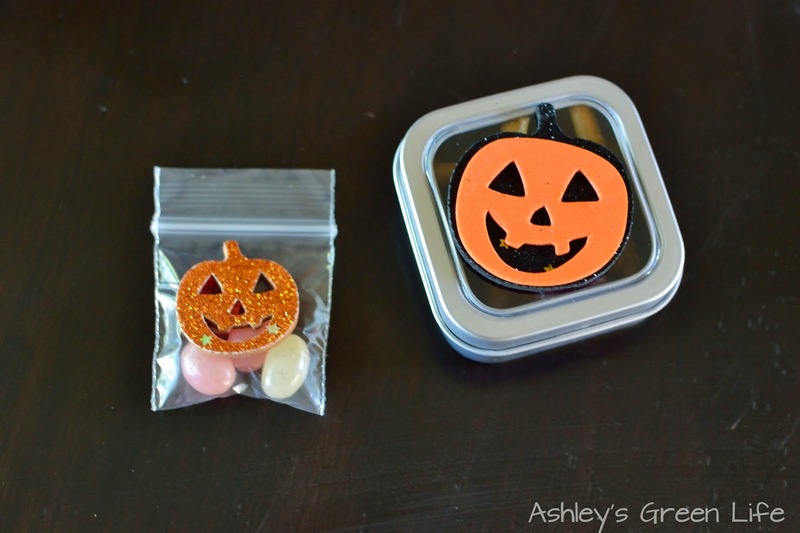 A pretty worth cause and a great way to get rid of that extra candy. Read more about it here. As you can see there's a few candy items in there, little boxes that I wil share more about below, but you can also see some non-candy items in there like glow sticks, notepads, and stampers, just to name a few. To go along with these non-food items, we will be participating in something called the "Teal Pumpkin Project" which is affiliated with FARE (the Food Allergy Research & Education organization). 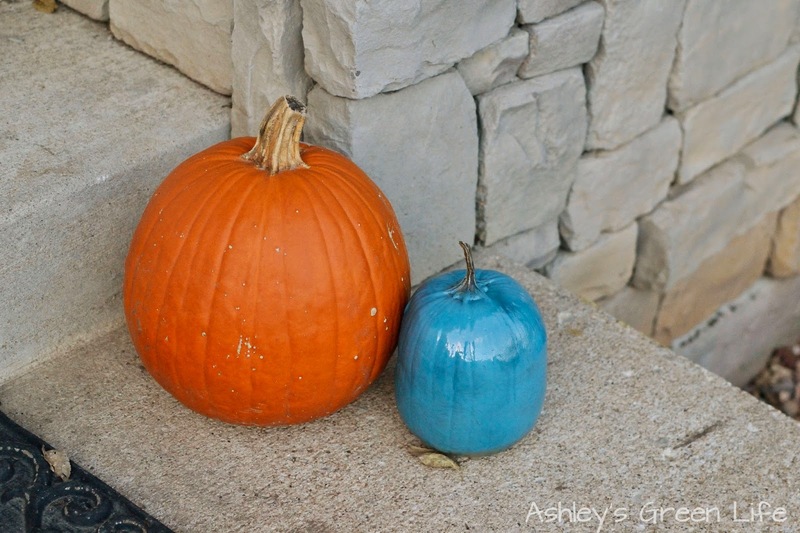 The basic idea is that homes can participate by painting a pumpkin teal (the color of food allergy awareness) and offering non-food items for kids that have food allergies. This allows kids with food allergies the opportunity to particpate in trick-or-treating with their friends and family without having to worry about eating or coming in contact with a food that could potentially make them sick. 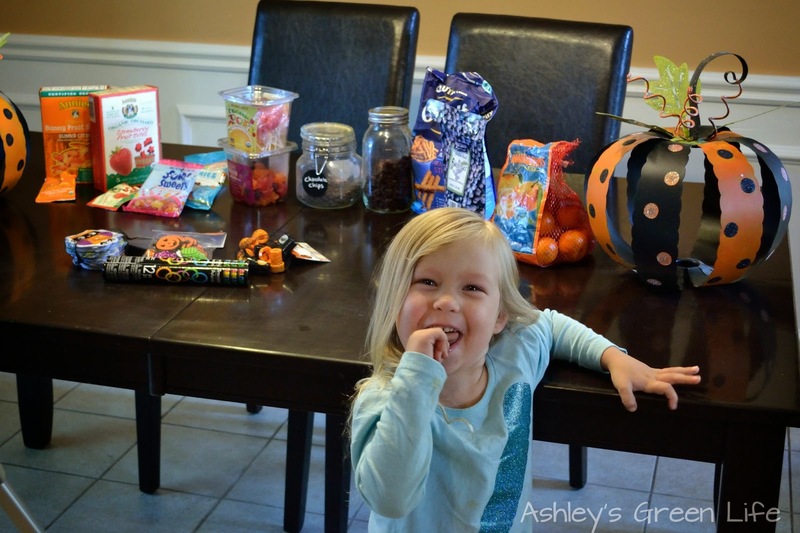 The Teal Pumpkin Project's website describes how you can still offer candy to other trick-or-treaters, but to have available one tray/bowl of non-food items for those with food allergies. Seeing as to all the ingredients I avoid, and Avery avoids as well, I jumped at the chance to participate. 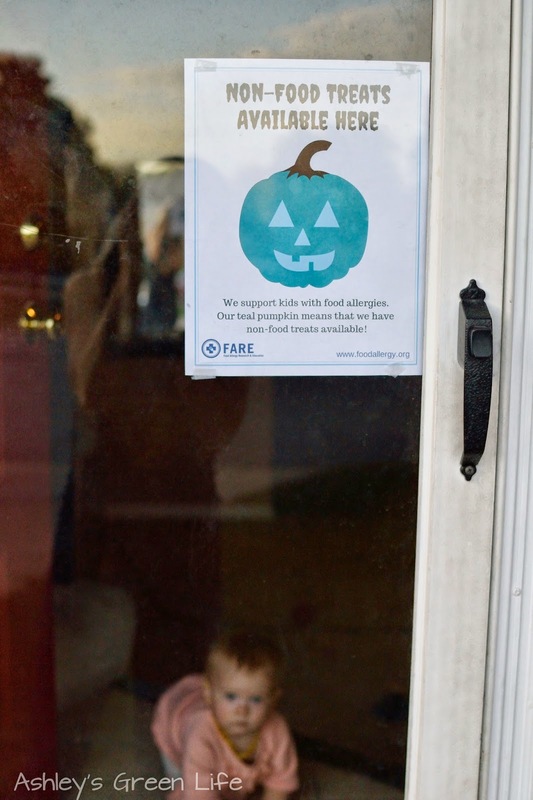 So we painted our pumpkin teal, and printed a sign you can find on their website to further bring attention to the fact that non-food treats are available (and explain why we have a teal pumpkin), and last we gathered our non-food items to pass out. to passing out the non-food treats! So on Halloween night I will have two trays: one with non-food items for kids with food allergies, or for anyone who just wants the non-food items, and a bowl of food items like candy and fruit. 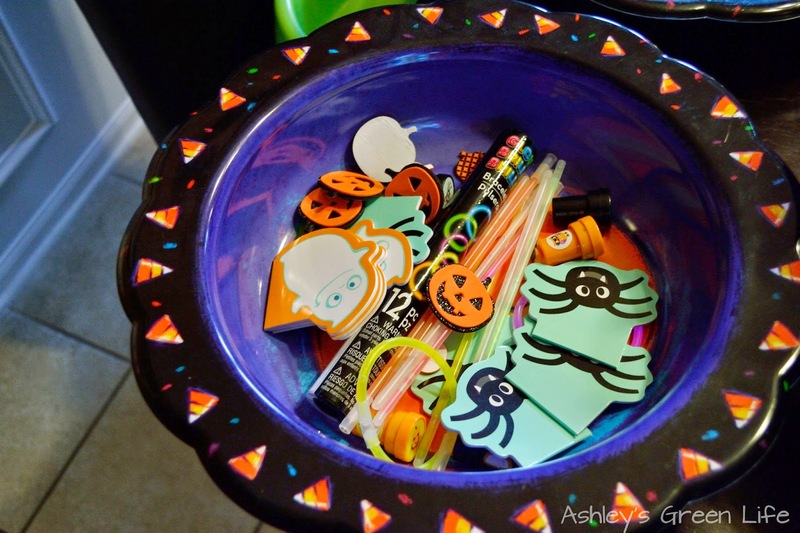 stickers, glow bracelets, and stampers. Alternative "Treat Bags" and "Treat Boxes"
Here's the back and open view of the bag and box. 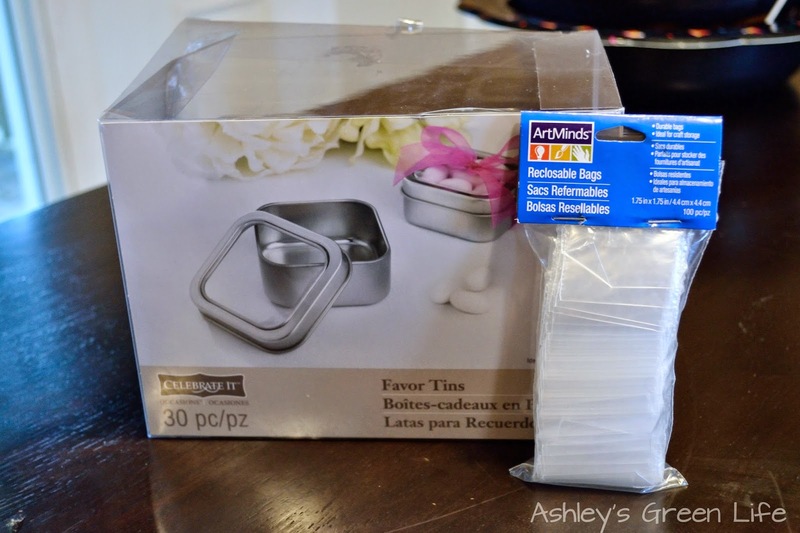 What I used to make these was a box of "favor tins" which we picked up from Michael's Craft Store for $20. We found them in the wedding supply aisle. As you can see there are 30 in the package, which is more than enough for us for Halloween. 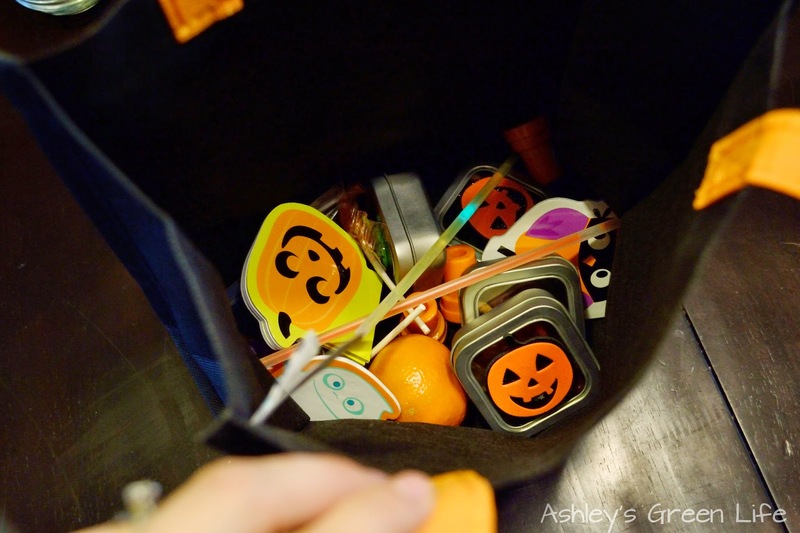 I love these containers because they are sturdy, allow me to package up Avery's Halloween goodies, and I can reuse them year after year. Yes, they are a little bigger and heavier than traditional candy, but I'll trade green-ness for that any day. The other packaging opition I found were these tiny plastic bags. 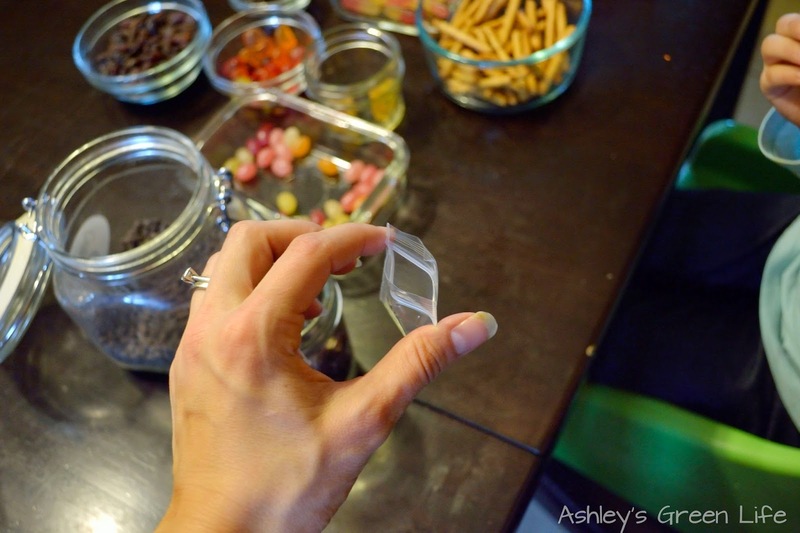 Not the greenest source I know, but they are 1.75" x 1.75" so they will provide me a packaging option that results in a smaller candy portion (aka less sugar)! This little bag cost me about $2-3. And since they look a little ghetto just as a plain plastic baggie, we jazzed them up with some Halloween stickers. 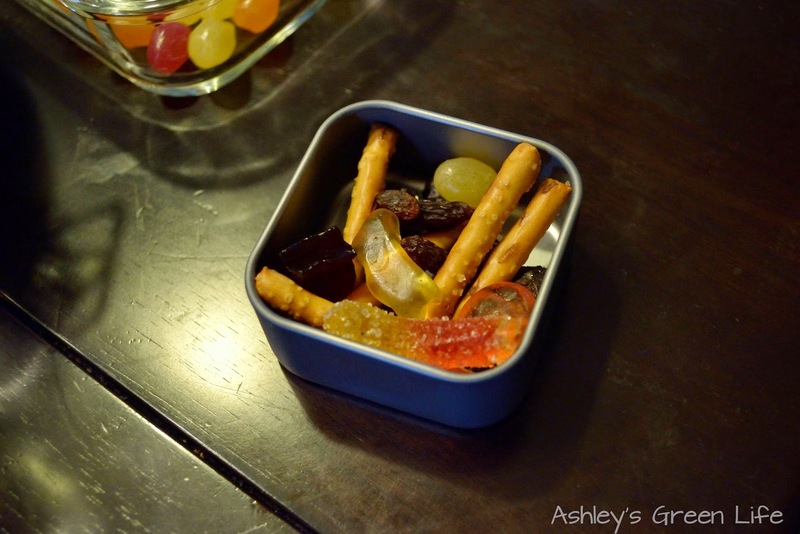 Annie's Bunny Fruit Snacks in "Sunny Citrus"
visual of the Surf Sweets candy. 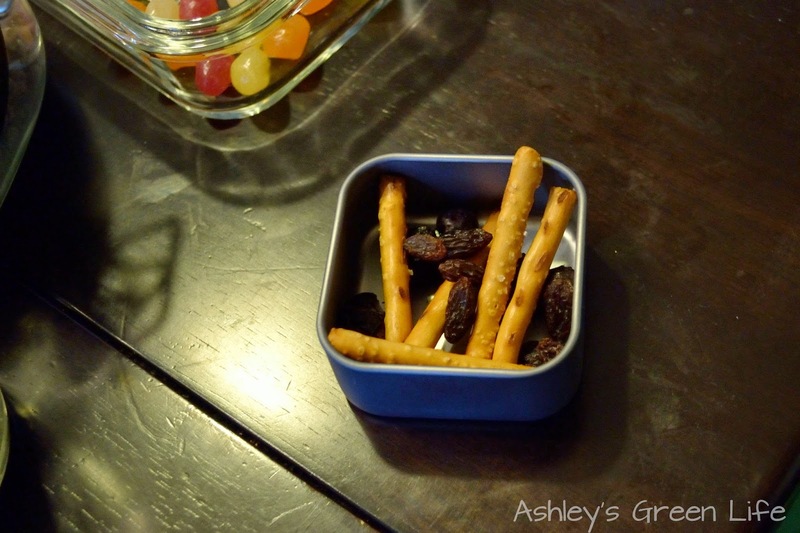 Why include these extra snack items? To balance out the sugar load! Like I said before, Avery doesn't eat much candy and so Halloween is no excuse to just go CRAZY with the sugar. I still want her to be able to enjoy her candy but I also wanted to balance it out with some other food items. 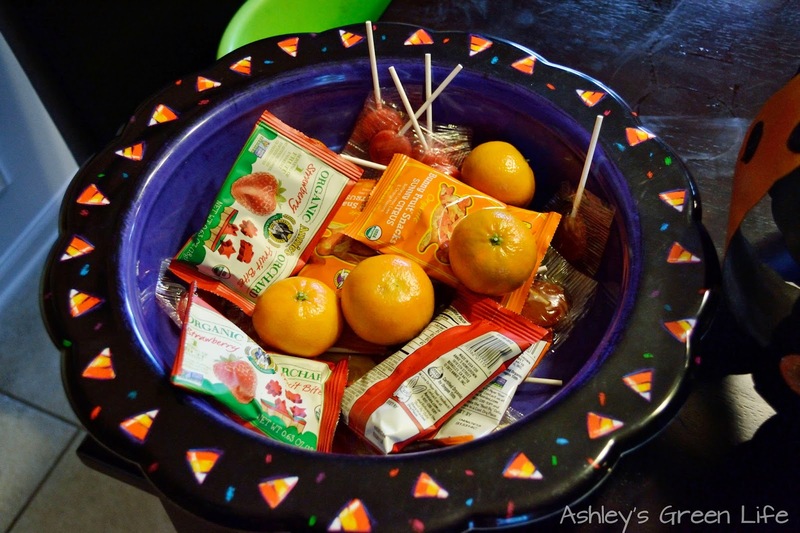 These foods will help "fill" the treat boxes so they are entirely full of just candy. 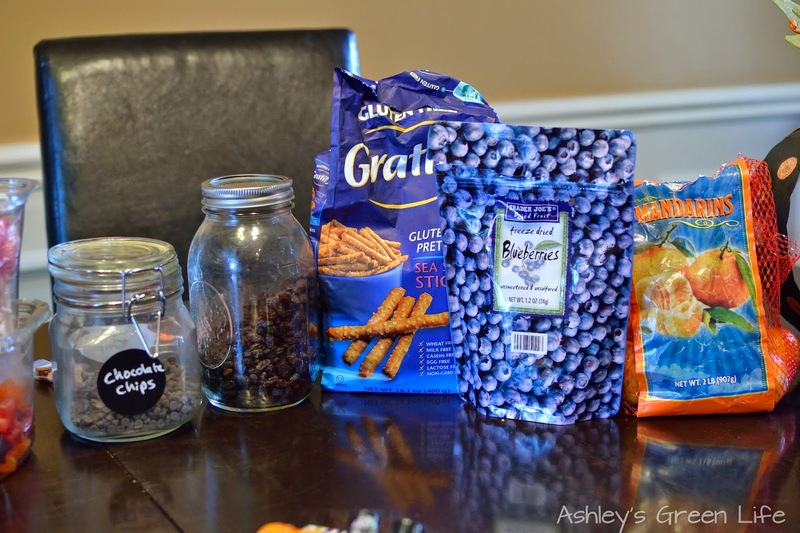 So to get started, I fill my boxes up with food items like pretzels, rasins, dried blueberries, and a few mini chocolate chips. I'd say I did about half with these food items and the other half with candy. 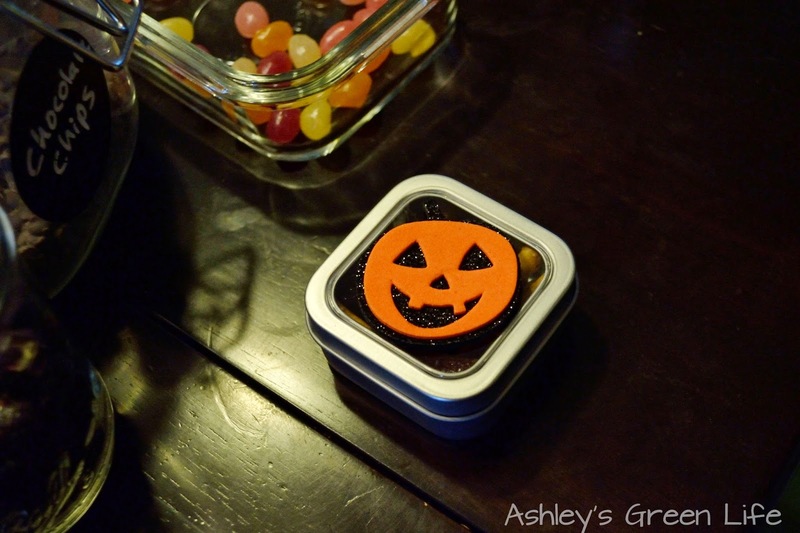 Last comes the lid, and a little Halloween sticker to make it a little more fun and festive! So that's our Treat Boxes. 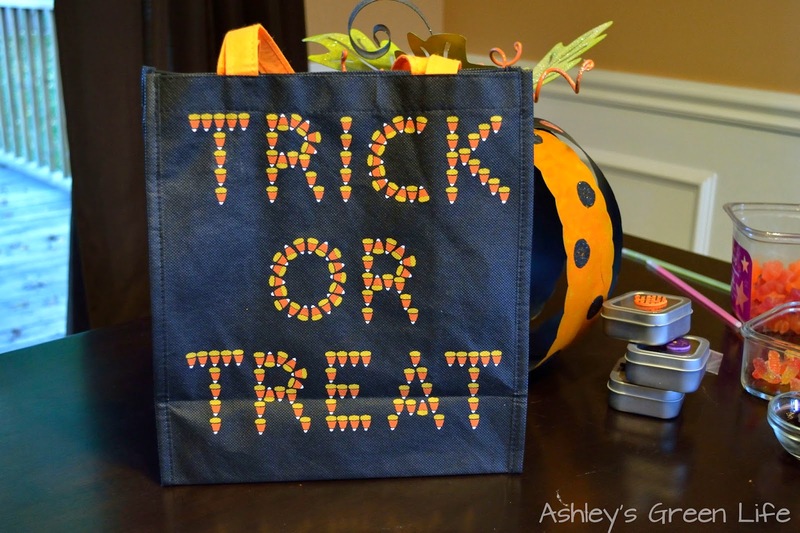 Next up are the Treat Bags. Same idea, smaller size. Not much fits inside of these bags, but 3-4 small pieces of candy seem to work just fine. As you saw above, these Treat Boxes and Bags will now go in her "Alternative Treat Bag" and when she comes home from trick-or-treating I will hand her that bag and let her have a few treats to eat/toys to play with. Then I will save it, and spread out how much she has each day so as not to load her up too much on sugar on any given day or time. (Can you tell I'm enjoying the control I have over this still since she's only 3?! I have no idea what I will do when she's 8 or 10 or 15...agh!). So there you have it, our alternative plan for Halloween. 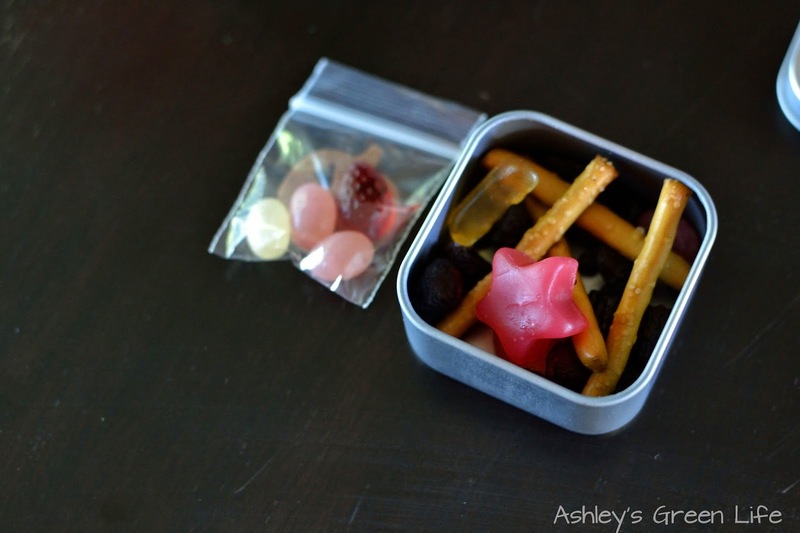 Do you have a favorite alternative candy brand that you like? Do you hand out any non-food items? Or do you hand out fruit or snacks instead of candy? Share below and we can all go a little greener and healthier this Halloween! I'll be sure to post back after Halloween to let you know how it all worked out, and if you try it to be sure to let me know how it goes.